Steve Evennett-Watts is a friendly and down to earth chef whose career was launched at the fledgling River Café in London where he worked as sous chef, under Rose Gray and Ruthie Rogers, and alongside Theo Randall (now at the Intercontinental), Jane Baxter (now at Riverford’s Field Kitchen), and Sam Clark (now at Moro). After stints at Chez Bruce and l’Odeon, Steve became Executive Head Chef of Villandry, Great Portland Street, where he stayed for eight years. In this role, he occasionally cooked privately for Tony and Cherie Blair at Downing Street, and gave advice on cooking for their children. Steve moved on to become a consultant head chef at the Hampstead gastropub, the Wells Tavern, before taking up the position of head chef at Chelsea Arts Club, and, in 2010, founding The Delicious Dining Company. Steve's food is lovely - stylish, elegant, tasty, and very skillfully prepared. We are his greatest fans. Marja Putkisto, Method Putkisto. 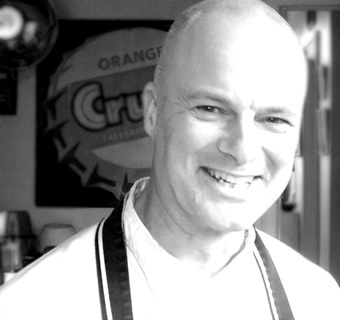 Drawing on his experience working in many different top restaurants, Steve cooks a wide range of dishes to the highest standard – from rustic Italian (from the River Café) to Classic French (from Chez Bruce). This means that when designing your menu you can choose anything from fresh pasta, ravioli or risotto to a classic bouillabaisse, oxtail stew, beef Wellington, steak, chips and hollandaise, or even top notch burgers for a barbecue party! See our menus for ideas, or ask Steve about dishes you have enjoyed and would like to replicate for your event. We draw on the services of carefully chosen waiting staff and extra chefs when they are needed. All our staff are highly responsible and capable individuals. We can also supply a butler or maitre d’hote to ensure the smooth running of your party or event. The Delicious Dining Company is based in Kingston upon Thames. We cover a 50 mile radius with some flexibility.